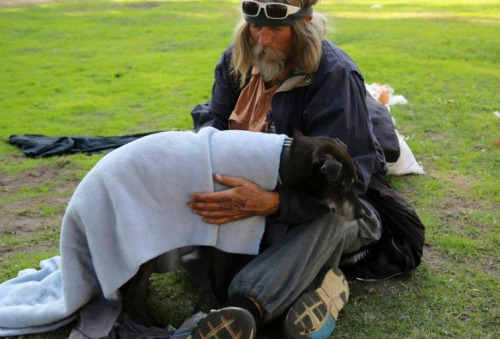 "Only 9 years ago, Karen Hanza, Founder of Angel Hanz for the Homeless, was homeless herself. “I’ve been struggling my entire life. I came from a horrible place of abuse and violence that started when I was a very small child. To escape the neglect and abuse, I ran to the streets thinking it would be safer." Karen found that living in the streets is dangerous, yet she found the support that she never had as a child in her dog. They were homeless together for years." Continue reading on Homeful LA. Newspaper Article Regarding Shelter in Belgium. In Honor of My Sister, Friend Vivi Lekens. What would you do if a police officer threatened to arrest you for trying to share a sandwich with a desperately hungry homeless woman that really needed it? Such a notion sounds absolutely bizarre, but this is actually happening in major cities all over the United States. More than 50 large U.S. cities have adopted "anti-camping" or "anti-food sharing" laws in recent years, and in many of these cities the police are strictly enforcing these laws. Sometimes the goal appears to be to get the homeless people to go away. Apparently the heartless politicians that are passing these laws believe that if the homeless can't get any more free food and if they keep getting thrown into prison for "illegal camping" they will eventually decide to go somewhere else where they won't be hassled so much. This is yet another example of how heartless our society is becoming. The middle class is being absolutely shredded and poverty is absolutely exploding, but meanwhile the hearts of many Americans are growing very cold. If this continues, what is the future of America going to look like? Food banks and soup kitchens in many German cities are having trouble keeping up with growing demand. Some are now abandoning their free food models in their effirts to continue helping the needy. In mid-October in a Wetzlar church hall, about 200 visitors sat in rows of tightly packed chairs, leaning against the walls with their arms crossed and sullen expressions on their faces, or standing in front of the open doorway, hoping to hear at least some of what was being said at an event that will have a significant impact on their lives. Some stood under open umbrellas, a symbolic gesture meant to convey the message that they don't want to be left standing out in the rain. A survey of 25 American cities, including many of the nation's largest, showed yearly increases in food aid and homelessness. Residents of Silicon Valley’s largest homeless encampment illustrate the widening divide between the nation’s haves and have-nots. While the rest of the world debates America’s role in the Middle East or its use of drones in Pakistan and Afghanistan, the U.S. Congress is debating just how drastically it should cut food assistance to the 47 million Americans - one out of seven people - who suffer from “food insecurity,” the popular euphemism for those who go hungry. When Montoria Freeland separated from her husband of 15 years in 2008, she left a four-bedroom house and economic security. Before long, her pay and hours as a pharmacy technician were cut and she found herself and her son facing homelessness. Freeland lived with family for a time, she said, and four months ago moved into transitional housing funded by the city government in Washington, D.C., while searching for work that pays more than her $8.25-an-hour retail job. Having lost her oldest son in a 2000 homicide, Freeland said she insists on looking for housing in a safe neighborhood for her surviving one, now 17. She found that’s available only at an increasingly steep price. It seems like the theme of the year is "this homeless problem." 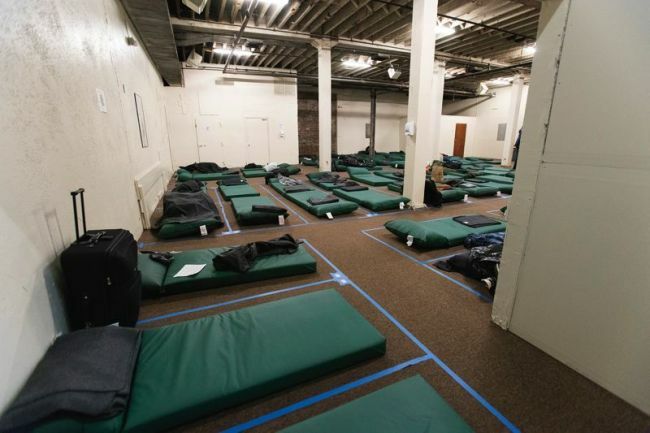 The coordinated efforts to sweep the homeless away are of major concern for a couple reasons. First, the real problem was created by the same ilk that are proposing the solution - in both cases it involves dehumanization, banishment, punishment and apathy. Next, when people allow the vulnerable to be taken away, do they really think it would stop there? The homeless population increased in 2013 by 6% from 2012. 26% of homeless adults suffer from some form of mental illness. Of that number, 239,403 are people in families, and 394,379 are individuals. Collectively, urban areas have the highest rate of homelessness – about 29 people per 10,000 – and those areas classified as “mostly urban” rank second with a rate of 19 homeless people per 10,000. Rural areas have the next highest rates: 14 people per 10,000. The Homeless are the most at-risk population. And we’re waging a war on them. Homeless people are being forced to live in caves as the UK's housing crisis continues to spiral out of control. An investigation has found people living in one of the worst hit areas of the UK for homelessness are using a network of sandstone caves to live in. In Stockport, which has seen an increase of 42 per cent in the number of people unable to put a roof over their heads in the last year, up to four people at a time have been sleeping rough in the secret warren - perched on a 20ft precipice overhanging the Mersey - just yards from public view. It's even worse than than we thought. 2 - When you add in the number of low income Americans it is even more sobering. According to the U.S. Census Bureau, more than 146 million Americans are either “poor” or “low income”. The world is heading into a horrific economic nightmare, and an inordinate amount of the suffering is going to fall on innocent children. If you want to get an idea of what America is going to look like in the not too distant future, just check out what is happening in Greece. At this point, Greece is experiencing a full-blown economic depression. As I have written about previously, the unemployment rate in Greece has now risen to 27 percent, which is much higher than the peak unemployment rate that the U.S. economy experienced during the Great Depression of the 1930s. And as you will read about below, child hunger is absolutely exploding in Greece right now. Some families are literally trying to survive on pasta and ketchup. But don't think for a moment that it can't happen here. Sadly, the truth is that child hunger is already rising very rapidly in our poverty-stricken cities. By Michael, on April 9th, 2013 Did you know that there are thousands upon thousands of homeless people that are living underground beneath the streets of major U.S. cities? It is happening in Las Vegas, it is happening in New York City and it is even happening in Kansas City. As the economy crumbles, poverty in the United States is absolutely exploding and so is homelessness. In addition to the thousands of "tunnel people" living under the streets of America, there are also thousands that are living in tent cities, there are tens of thousands that are living in their vehicles and there are more than a million public school children that do not have a home to go back to at night. The federal government tells us that the recession "is over" and that "things are getting better", and yet poverty and homelessness in this country continue to rise with no end in sight. So what in the world are things going to look like when the next economic crisis hits? What is happening to you America? Once upon a time, the United States was a place where free enterprise thrived and the greatest cities that the world had ever seen sprouted up from coast to coast. Good jobs were plentiful and a manufacturing boom helped fuel the rise of the largest and most vibrant middle class in the history of the planet. Cities such as Detroit, Chicago, Milwaukee, Cleveland, Philadelphia and Baltimore were all teeming with economic activity and the rest of the globe looked on our economic miracle with a mixture of wonder and envy. But now look at us. Our once proud cities are being transformed into poverty-stricken hellholes. | Mon May 20, 2013 12:55pm EDT WASHINGTON (Reuters) - The number of people living in poverty in U.S. suburbs surpassed the number of poor in cities over the past decade, driven by strong growth in overall suburban populations, according to an analysis released on Monday. 3. According to U.S. Census data, 57 percent of all American children live in a home that is either considered to be "poor" or "low income". VAN NUYS - A 24-year-old Van Nuys man accused of setting a homeless woman on fire as she slept on a bus bench was charged today with attempted murder and aggravated mayhem. Dennis Petillo was scheduled to be arraigned sometime today at the Van Nuys Courthouse. He allegedly set fire to the 67-year-old woman around 1 a.m. Thursday at Van Nuys Boulevard and Sherman Way. According to police and prosecutors, Petillo poured a flammable liquid on the woman, identified by some witnesses only as Violet, and set her on fire while she was sleeping. Witnesses said Petillo went into a Walgreens store at the intersection and purchased what may have been rubbing alcohol, then walked out of the store and doused the woman with it. "He just poured it all over the old lady, then he threw a match on her, and then started running," said eyewitness Erickson Pina, who said the suspect also threatened him with a knife. Pina told a camera crew that he called 911, then followed the man until police arrived and arrested the suspect. An area resident told ABC7 the woman had essentially been living on the bus bench for years. The woman remains hospitalized in critical but stable condition, according to the District Attorney's Office. Petillo faces up to life in prison if convicted, prosecutors said. 3/30/2013 - Update regarding Violet's recovery: Violet is recovering from her burns, but has a long way to go.